BOSTON, MA, UNITED STATES, November 23, 2018 /EINPresswire.com/ -- The tradition of going to an auction in a physical brick and mortar space is no longer the only way to bid on items. Today, auction houses are expanding their reach by encouraging their clients to download their mobile app or to go directly to their website to participate in their sale. 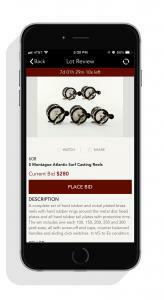 Expanding ways to engage participants in a sale is what auction houses are finding crucial in today's digital world. Lang’s, a specialty antique and collectible fishing tackle auction went completely online in October 2015. They selected Auction Mobility as their digital platform to run their auctions, help attract new bidders and grow their business. Despite having a traditionally older client base, their digital strategy is paying off in a big way. In the last three years we have had several upgrades and new features seamlessly implemented. Each new feature has given us another opportunity to advertise our continued commitment to our customer's needs and wants. And as bidders have become more self-sufficient, our man-hours have decreased - before, during and post-auction. Complaints related to online bidding are now non-existent. A truly shocking statistic has been the bid migration to mobile devices, especially considering the age of our most serious collectors. 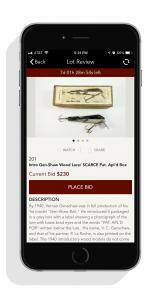 An average of 43% bid from their phone or tablet - that is a huge number for our audience. The vast majority of our bidders are older businessmen, who have little time to travel to an auction. If not for Auction Mobility's user-friendly mobile platform, cell phone notification and real time bidding, we have no doubt the participation would be far less.